At its simplest, blocking your knitting means getting the knitted fabric wet and pinning or otherwise forming it into the desired final shape. The moisture relaxes the fibers, making them more pliable. When the fabric dries, it holds whatever shape you'd stretched it into. The result is tidy, straight edges and fabric that actually lays flat and smooth. Blocking your knitting is also a quick, easy fix for common problems like curling stockinette-stitch edges or uneven stitch tension. Blocking is a simple procedure, and one that you'll turn to again and again. If you don't have a sizable chunk of carpeted floor where you can stretch your knitting and leave it for at least a day (without it getting trampled on), you'd be better off making a blocking board. Depending on the size of the project, that can be as simple as an actual bulletin board or sheet of cork with push pins to hold the knitting in place. Or you can create a larger board with a sheet of rigid foam, and use T-pins to hold your knitting in place. If you do have the floor space to lay your knitting out, you'll need the following materials for blocking. The start of a blocking project, and the T-pins used to secure knitting in place. Lay your dampened knitting flat on the blocking surface and, starting from one corner, pin it into place on the blocking surface, stretching it as needed as you go. If you're blocking pieces that need to line up with each other, like pieces of a sweater for example, go ahead and block the pieces with the matching edges right next to each other. That way you can be sure the edges will line up once the blocking dries in place. There's no hard and fast rule for how many pins you need to hold the knitting in place. 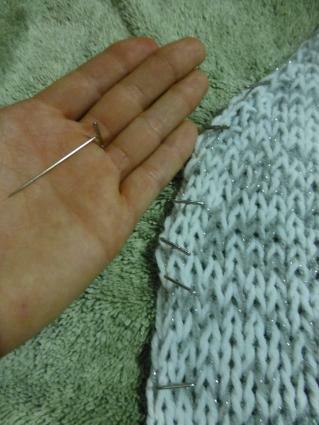 The more you're distorting or stretching it from the original knitted shape, the more pins you'll need. It's best to err on the side of having too many pins on hand instead of too few. If whatever you're blocking is almost the right shape already and you just want to even up the edges, you can pin the relevant parts in place and then dampen the fabric with the spray bottle. Make sure you're using rust-proof pins so that they won't discolor your knitting. A knitted wrap before blocking with curled edges and an uneven shape. 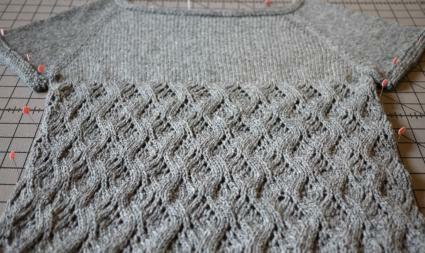 The same piece of knitting, after blocking. The edges are now straight and you can see the shape. When you're a novice knitter, blocking knitting probably doesn't make that much difference. When you're making unshaped projects like scarves, getting the project exactly square and the same width all the way across isn't all that important. But once you start making shaped garments or doing anything that requires you to line up edges, like assembling a sampler afghan out of separate blocks, blocking becomes more important. The front and back of your sweater need to be the same size, just as every block in that afghan has to end up the same size, regardless of the stitch pattern, for the rows to line up. Once you master blocking however, you might find yourself doing it on all your projects. It's a great way to get the stitches to really open up and display their texture. You can even stretch simple projects like scarves, shawls and the like several sizes larger with careful blocking. Just make sure you don't overdo it; it's easy to come back and re-block the piece a little bigger if you need to, but almost impossible to get the fibers to tighten up again if you blocked something too big. If you're working with very delicate fibers that shouldn't be washed, you can relax the fibers by steaming instead of wetting them down. Stretch the project into shape (pin it in place if necessary), then cover it with a dry cloth and hold a steam iron above (but not on) the upper cloth to relax the fibers. If you're blocking odd shapes, you might have to get creative with the blocking surface. For example, you can block hats flat, but the process is much faster and easier, and the results even better, if you moisten the hat and then drape it over a clean ball of the appropriate size. Opt for a slightly smaller ball than the head size of the intended recipient; this preserves enough stretch and elasticity in the fabric to make for a comfortable, custom fit. The only downside to blocking your knitting projects is that you'll have to patiently wait for them to dry. If you're on a schedule or in a hurry to finish a piece for a gift or other occasion, don't forget to budget some time for blocking. The results will be worth the extra wait.